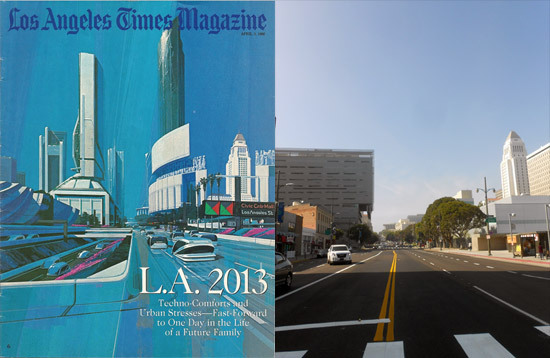 The Real "Los Angeles 2013"
Side-by-side comparison of Syd Mead's 1988 illustration of 2013 Downtown Los Angeles, and the real-life photo of March 2013 DTLA, looking west along 1st Street at San Pedro Street in Little Tokyo. No super-tall towers to dwarf the stately City Hall, nor split-level streets (Whatup with that?! ), but we do have the "Death Star" Caltrans building and zebra crosswalks. The whole local Intwerwebz lit up last week when the Los Angeles Times decided to open their published time capsule from April 3, 1988 of the Los Angeles Times Magazine article on what the city would be like in 25 years -- That is, 2013. 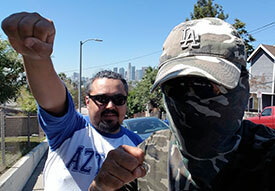 The Militant, still a teenager, actually remembers reading that article with eager curiosity, and marveled at the supertall towers and rail transit tubes that may or may not be common sights in Downtown Los Angeles. But all this talk about robots was pretty awesome stuff. Man, the future. That was pretty rad. It was a bold new future, a brave new world. But 25 years later, we read the article with much amusement. Predicting the future will always turn out both correct and incorrect. Take, for example, the city of Detroit, which has been victim of urban decay and corruption in local government, but still lacks a cybernetic officer in its police force. There are lots of variables. For no one in '88 could predict, say, the Rodney King incident and the subsequent 1992 Riots. Or the 1994 Northridge Earthquake. Or the NFL moving out. Or the Lakers and Kings moving Downtown. Or 9/11. Or climate change. Or the demise of the Los Angeles Times Magazine. Or blogs. Or social media. Or CicLAvia. Or the fact that the Dodgers only garnered one World Series championship since then. Or...(Okay, the Militant will stop). The Militant went through the article and noted down some of the innovations listed in writer Nicole Yorkin's fictional account of a day in the life of the Morrow family of Granada Hills. The Militant has each of those "innovations" listed under three ratings: "Yes," "No" and "Sorta" when it comes to how prescient it was. Mandatory staggered work plan (Sorta) - Back when Los Angeles was a more white collar town, working 9-to-5, so to speak, this was talked about back in the day as a way to mitigate traffic. But in a more service-based workforce, there are people working around the clock. Computer printer printing out news (No) - The Militant knew years ago news would be computerized, but more like the home-printed version in the article than the wireless, mobile digital form we enjoy today.And man, what a waste of paper! Domestic Robots (No) - Cylindrical vacuum cleaners aside, no, there are no domestic robots in 2013. We're still a far way from the Jetsons Era, and such robots will remain to be limited in the science fiction film realm. Though if you could tell the people back in 1988 that there will be a Star Wars VII sequel coming out in two years, their minds would be blown. "Los Angeles-based multinational Corporation" (No) - The world in 1988 had a feeling that Japan owned everything and Los Angeles, across the pond from Japan, would be the financial center of this side of the Pacific Rim...since then, the big overseas capitalist power went to China (ironically, a communist country) and the Fortune 500 companies based in Los Angeles either merged with other companies based elsewhere or just moved out. India cigarettes (No) - Though India is the 2nd-largest tobacco producing country in the world (595,000 tons annually as of 2000), it's far surpassed by China, which produces 2.3 million tons per year. Unlike coffee or tea, the origins of tobacco products is largely unknown to most consumers. Denturinse (No) - With modern tootbrushes boasting advanced forms of bristle arrangements, and even some disposable models being battery-powered, ain't no way a rinse product is gonna clean yo teefs. Robo-pets (No) - Y'all blew your chances 15 years ago with the Tamagochi. Nutrition plan (No) - Our kitchens still don't automatically provide these to us. Actually, with so much GMO food, would we really want that? Plastic key-card (Sorta) - The protagonist in the 2013 story opens and runs his car with a plastic key-card. Though such things are mainstream in hotel rooms, they're not used in automobiles, especially since the whole wireless thing blew that usefulness out of the water. Electronic map system (Yes) - Yes. Or more like GP-yes. Commutes 3x long (No) - You complain about the traffic, yet don't even know it's not as bad as we all thought it would be. The average freeway trip forecasted for 2013 in the article was 47 minutes. In the real 2013 its around 29 minutes, only twice the 15 minute commute from the 1980s. Of course, though the article predicted Metro Rail (which was two years into construction at the time of writing), it didn't predict things like Metrolink, rapid buses, bicycle commutes or the recession, all of which reduced the number of automobiles on our freeways. Automobile Trains with Inductive Couplers (No) - Oh no, that's kinda wacky. We're just getting used to those ExpressLanes with those fancy transponders. Computer pen pals (Yes) - It's called Facebook, anyone? Future Rock (No) - The big music wave in the 2013 Grammy Awards was folk music. Rock has gone retro for quite a while. And no, dubstep doesn't count. Pilot program schools with scale down size, community-based operation (Yes) - They call them charter schools. Smart Cards, Fiber optics and artificial intelligence in schools (No) - Are you kidding? the LAUSD is far too concerned with dumbing-down education via their obsession with standardized testing to invest in any of that. Large Screen Displays (Yes) - Though not necessarily in LAUSD schools, colleges do have video projection and large LCD monitors at their disposal. Toy Ultra-Laser (Yes) - One of the kids in the article has his laser confiscated from him. You can, too, if you aim yours at an airplane or a helicopter. Telecommuting (Yes) - Though not nearly as widespread, telecommuting is commonplace enough in the industries that are compatible with it. "Condensing and synthesizing information form all over the globe" (Sorta) - One of the characters does this for a living. In the real 2013, we have computers doing this for a living. It's called Google. "Flashing his monthly metro rail pass at a uniformed guard" (No) - Guess they couldn't predict TAP cards. Though you still have to show (tap) yours to uniformed guards every once in a while on trains or stations. Elevated Track (No) - While some of the Metro Rail lines run on elevated structures, it's not nearly as used as the article predicted, possibly assuming that subway tunnels "wouldn't work in earthquake country." The 1989 Bay Area earthquake and every earthquake in Japan proved that was wrong, and that tunneling was the way to go. Not sure how those Beverly Hills folks think about that, though, if we built an elevated Metro Rail line through their town, they'd scream bloody hell 10 times louder. Computer Banking (Yes) - Online banking is totally mainstream in today's world, but video-conferencing with tellers isn't even necessary. Downtown population (Yes) - Perhaps an inevitability, but yes, tons more people live in DTLA than back in 1988. Speaking of the Downtown population, it's interesting how this article focused on a family in suburban Granada Hills. Today, it would either be people living closer to the city, say, in Silver Lake or Palms, or farther away in now-suburban communities like Santa Clarita, Rancho Cucamonga (yay Tongva) or Aliso Viejo. Another interesting thing was that lower-income communities were totally overlooked. Whether they would be eventually gentrified or ceased to exist was galaxies away from the tone and scope of the article. But history has a funny way of working; had it not been for the '92 Riots, and their lasting impact, both positively and negatively, we wouldn't be talking about lower-income communities today. And aside from the (assumed) mixed white-Latino marriage of the Morrow family, we saw little of how Los Angeles, already a very diverse multicultural metropolis back in '88, would turn out in terms of culture. So then, what would a day in the life of Los Angeles look like, 25 years from now, in 2038? Of course, knowing what we know now, it all depends where in Los Angeles and who we're focused on. Commandeered by Militant Angeleno @ 1:30 AM 3 comments: Hyperlinks, yo!